On April 15 at a construction site in Shuri High School in Naha, Ground Self-Defense Force personnel disposed of an unexploded U.S. 250 kilogram shell. 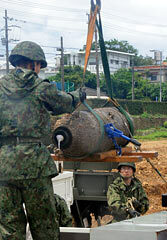 Just before 11:00am on April 15 in the grounds of Shuri High School in the Mawashi area of Shuri, Naha, Ground Self-Defense Force personnel disposed of an unexploded WWII U.S. 250 kilogram shell (120 centimeters long and 36 centimeters in diameter). The shell had been found when the reconstruction of a school building was carried out in February. About 2350 people were evacuated from about 845 households and 95 business premises within 288 meters of the site where the disposal work was carried out. Traffic control was implemented for 19 locations, including Route 29. About 20 unexploded shells have been found at Shuri High School during drilling works for the reconstruction of a school building and as the result of magnetic surveying that has been carried out since August 2011. Twelve local residents were evacuated to the gymnasium of Josei Elementary School in Naha. The disposal work was completed about an hour ahead of schedule and no damage occurred. The areas evacuated included the Hotel Nikko Naha Grand Castle and part of Shurijo Castle Park. The hotel did not accept guests in the evening of April 14 and stayed closed until the disposal work was completed. The park let visitors temporarily park their cars at the site of the former Okinawa Prefectural Museum. Naha Bus services were diverted from 9:00am to 11:00am.